Beginning his journey in the martial arts at the age of 11, by 17 years old Steve had earned his first black belt in Tae Kwon Do under the Western Masters System in Salisbury, Maryland. He moved to Florida in 1998 and started training Judo and Brazilian jiu-jitsu (BJJ) with Bill Murphy and Marcio Simas and received the blue and purple belts under the Gracie Barra system. Bill stepped down in 2002 and (now 4th Degree Black Belt) Charles dos Anjos, took over as head instructor of the Sarasota school. 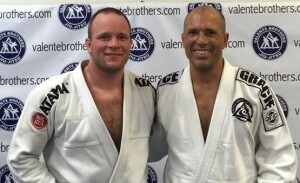 Under his tutelage, Steve received the brown and black belts from the UFC legend himself, Master Royce Gracie. All of Steve’s belts (including the black belt) have also been endorsed by the Florida Federation of Brazilian Jiu Jitsu. For the past 18 years, Steve has focused most of his training in BJJ, Judo, and American Wrestling. 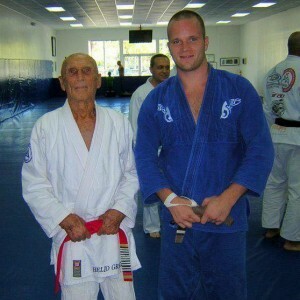 In October of 2006, he was awarded the rank of black belt by Master Royce, the son of the founder of Gracie Jiu-Jitsu (GJJ), Grand Master Helio Gracie (1913-2009). In January of 2010 Steve was promoted to the rank of Instructor, and August of 2011 to First Degree Black Belt by Professor Charles dos Anjos. In April of 2013 Professor dos Anjos awarded Steve with the Second Degree on his Black Belt, making him one of the highest ranked American BJJ Black Belts in the country. With the Second Degree also comes to the Title of Professor (literally translated as the teacher), which is a huge honor under the Gracie System. December of 2015 he was awarded the blue bar by Master Royce Gracie. The blue bar signifies Steve’s complete understanding of the five elements of Gracie Jiu Jitsu; Striking, Takedowns, Grappling, Self Defense and Philosophy. Steve still keeps in close contact with Master Royce and Professor dos Anjos returning to Florida to train and teach several times a year. At the time Steve was only the 9th Royce Gracie black belt given in the world, as well as his fastest black belt at just eight years of training. Steve is still very competitive in the jiu-jitsu community, and has placed in many regional and international tournaments and competed in invitation-only super fights. He supports the growth of the sport as the Senior Most Referee for the North American Grappling Association. He travels internationally with NAGA and has worked with the company for over 16 years, including teaching seminars to the competitors for many of the tournaments. Steve also regularly teaches seminars to many Royce Gracie network schools, several local and Fight To Win Affiliate schools and Military / Law Enforcement in North Carolina, South Carolina, West Virginia, Virginia, Maryland and Florida. In 1998 Steve also began competing in mixed martial arts (MMA) competitions. With an amateur record of 4-1 and pro record of 3-2. He also holds the current record for one of the longest MMA fights in Florida history of 48 minutes with no breaks. Then going on to fight two more times that same night in an eight man tournament with no time limits and a weight class of 180lbs and under (a record that will stand forever being that style of tournament is now illegal in the U.S.). Since moving to North Carolina in 2007 Steve now runs one of the largest and most successful BJJ teams in the Charlotte area and has led his team to win several MMA fights, and countless World, National, State and regional medals in Brazilian Jiu Jitsu. He is known for being one of the most technical instructors in the Carolinas, and Fight To Win was named “The Best School In the South East” by the North American Grappling Association. With the school nearly at its sixth-year mark in Charlotte at the time, this was a huge accomplishment for everyone on the team.